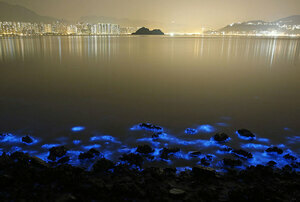 Photos of a bioluminescent bloom by Noctiluca scintillans plankton on the Hong Kong seashore last week. 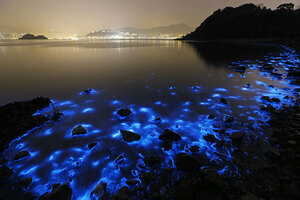 For all its ethereal beauty, the phenomenon, known as ‘sea sparkle’, is caused by pollution (in this case, agricultural runoff) disturbing the dinoflagellate. Posted in Nature and tagged plankton, pollution at 11:07 am on January 26, 2015 by Broadsheet. Poor Predator been shot has he? 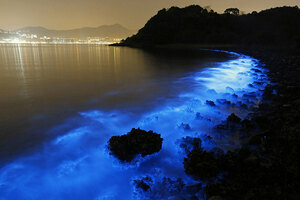 Seen this before in Mexico and the States, don’t swim/surf in it or you will be spewing from every hole you have! 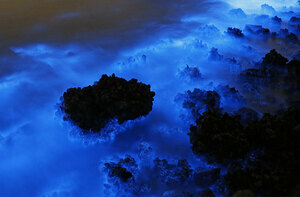 The bluey colour is only visible when the stuff is disturbed by movement, so at night when a wave breaks it lights up like a lightning bolt is inside it. Awesome sight. SOQ on Free This Evening?